Copper has been the primary element used in railway construction so far, and it shows no signs of slowing down in the future. Despite technological innovation, railways have not ceased to rely on copper cable. 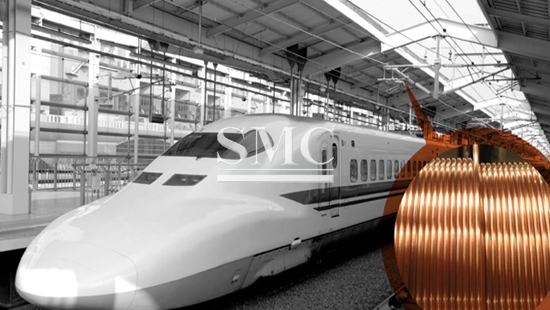 Be it a locomotive train, a non-high speed, a bullet train or even a Maglev, what trains all have in common is the use of copper cable, which has incredible electrical conductivity properties. In other words, copper is an essential component in all railway technology developed in the world so far! Even in high-speed trains and bullet trains, copper has been used as a connector, being placed in railway’s overhead equipment or in ground-level side rails. Even underground infrastructure uses copper connector cables placed in a central third rail. Finally, in innovative Maglev technology, copper still performs the same role, and is present in ground level rails. It also allows for magnet motion within a copper tube. No matter the metal’s location in the system, it is the copper wires’ ultimate role to transfer electrical energy from the station to the train and guarantee the train’s motion. With China’s commitment to expanding its railway network, we can only expect a more intensive use of copper in the country. Many sources report that by the end of 2017, the Chinese railway system will have reached a total length of 127,000 km -25,000 km of which are high-speed tracks. By 2020, the nation's rail system is expected to reach 150,000 km! At present, 60% of the world’s high-speed railway supply and 40% of copper demand is located within Chinese borders. These figures show that copper is by no means slowing down, and will continue to play a pivotal role in China's infrastructural development plans. In fact, electrical conductivity is not the only advantage that a metal like copper has to offer. Its resistance to temperatures，moisture, corrosion and its durability make it a great candidate for outdoor use in railways’ wires. Likewise, the metal’s ability to keep 90% of its properties when recycled and the possibility of being recycled an infinite amount of times make it a relatively sustainable commodity for large-scale public projects. Finally, copper’s anti-sparkle property can guarantee some level of safety and its naturally anti-bacterial status assures hygienic standards. If further combined with other metals, such as magnesium or zinc, copper can reach even greater potential becoming suitable for an even wider range of purposes. At Shanghai Metal Corporation we are aware of the fast-paced developing technologies involving our national railway system. Our copper earth strip/tape, lead frame copper strips and copper clad steel earth rods are examples of products that we proudly supply for such purposes and many others. SMC is passionate about developing new technologies to improve copper’s performance even further. For a complete list of products, inquires and other information, please click here.